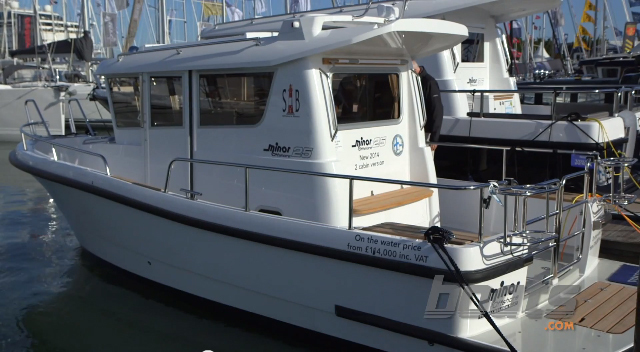 If ever there was a boat that made you want to shake the designer by the hand, the new 25 from Minor Offshore is it. Alex Smith takes a closer look. The Minor 25 achieves amazing things with limited space. They own more boats per capita than any other nation on Earth and they use them not just for the odd day out but as a fully integrated part of their everyday lives. 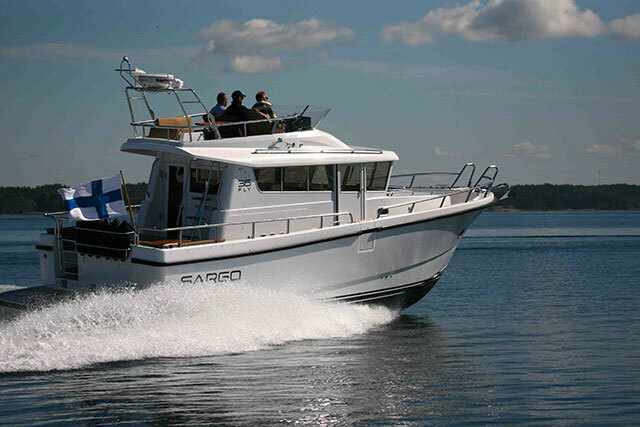 With an average of around four boats per household, their knowledge of boats and the level of competence they expect from their builders is virtually unparalleled – so when a reputable Finnish boat yard produces a leisure boat, you know from the start that ease of use and strength of construction are likely to lie at the very heart of the project. Originally introduced in 2009, the 25 might be the smallest of the five hull lengths in the Minor Offshore range but she is designed very explicitly as a tough and resilient four-season boat. 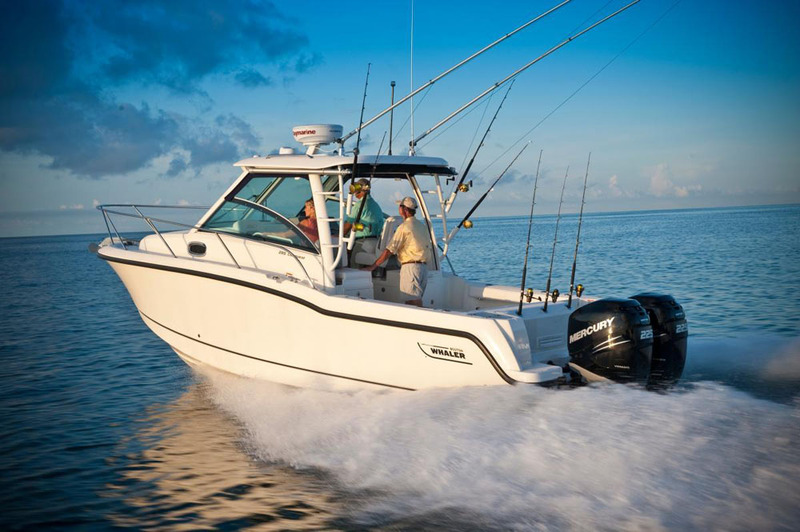 To that end, she comes with a fully enclosed pilothouse, well-protected walkaround, single-level side decks and an open aft cockpit that can be used as easily for fair-weather gatherings as for fishing trips. 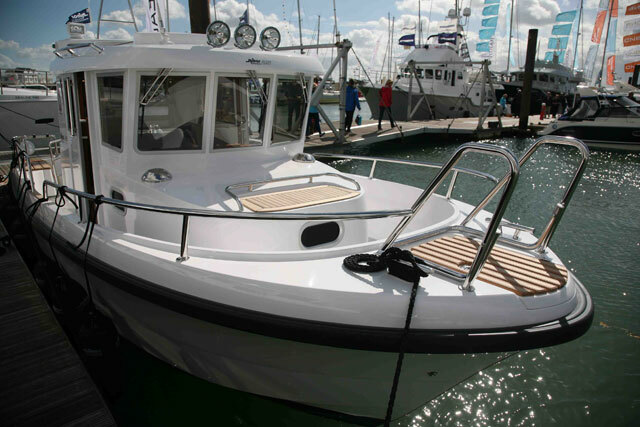 Underpinning the whole thing is a robust and well-proven Category B-Offshore hull with stable tracking, a relatively soft, dry ride and the kind of running efficiency that will apparently see her cruising on as little as one litre per Nautical mile. Plainly, this blend of qualities represents a very sound basis for a good leisure boat - and the Minor Offshore story becomes all the more confidence-inspiring when you consider that this vessel is built by Sarin (Finland’s premier boatyard) in a region which is justly famous as the birthplace of some of the world’s best all-season craft. 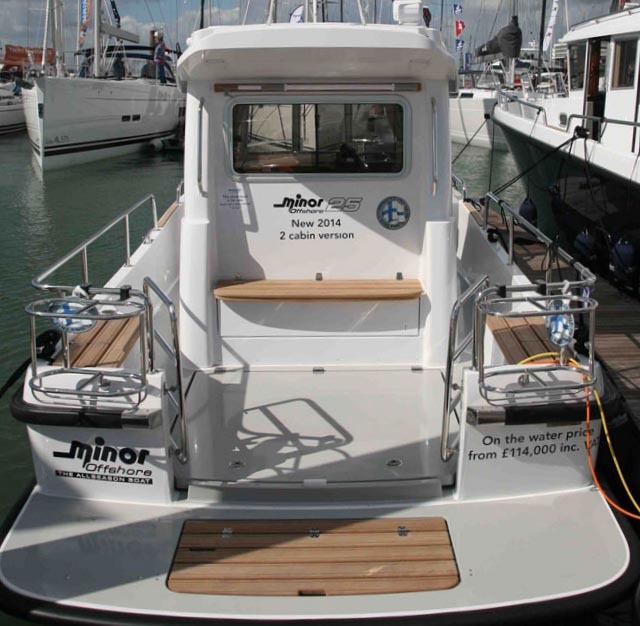 The moment you step onto the aft swim platform, to be greeted by an elevated guardrail, a thick, powerful rubbing strake, a prop inspection hatch, twin fender baskets and a pair of cockpit access gates, you know this is a boat that goes the extra mile. Step forward into the cockpit and that impression continues, with a broad open fishing space lined on three sides by wooden benches. 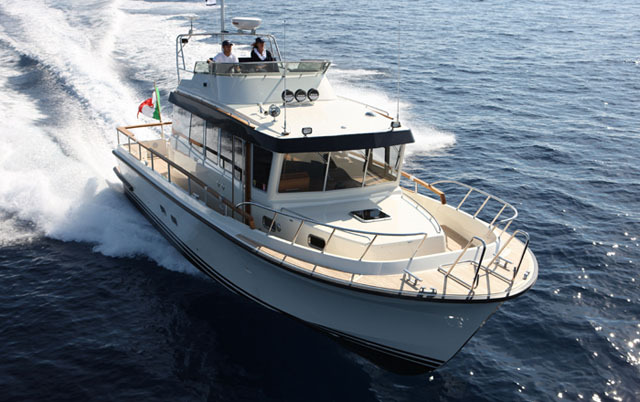 From here, a pair of walkways runs up either side of the pilothouse and in addition to proper embarkation points on both sides, you also get a neatly arranged foredeck with a secure seat, plenty of grab rails and a step-through bow with an ingenious hinged ladder. The simple three-bench aft cockpit is very effective. However, the really clever part (and the one feature that enables everything else to work so well) is the absence of an aft door. 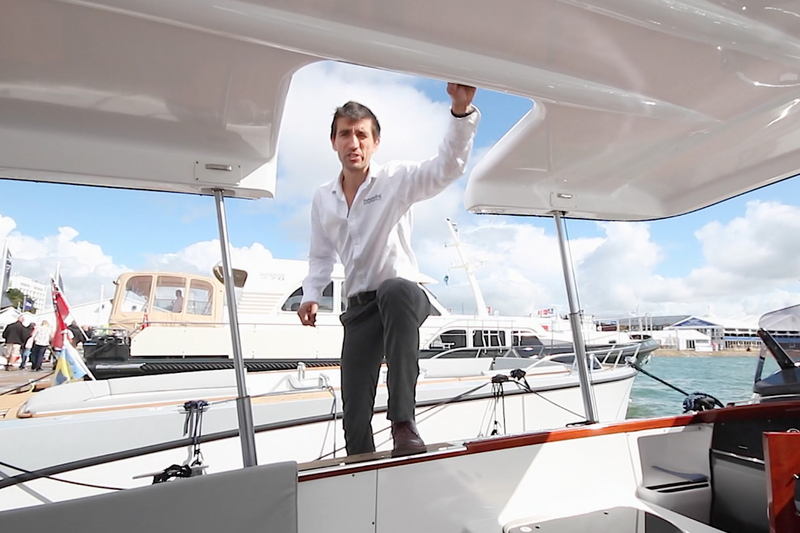 This means that instead of direct access between cockpit and pilothouse, you get two sliding doors (one on either side of the structure) plus a big sliding roof hatch to supplement the light – and because there is no need for access through the back end of the pilothouse, that entire section can be used to the utmost. Here, that means an unbroken C-shaped seating unit on the inside, with a permanent aft-facing bench and a storage box on the cockpit side. An ingenious second double berth runs laterally beneath the saloon seating. Immediately then, this side-access design generates a pair of very worthwhile benefits - but a third (rather radical) benefit also emerges. 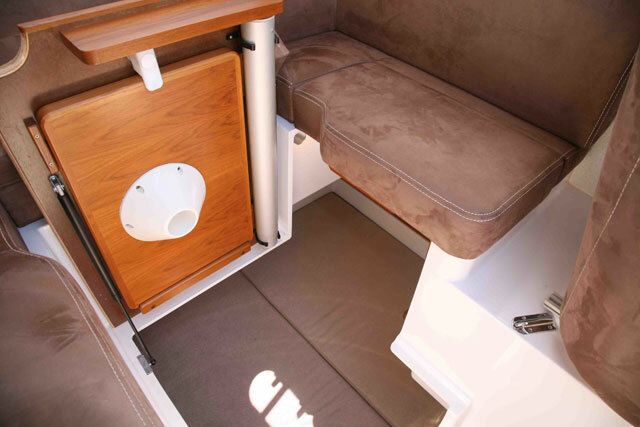 When you stand in the saloon, remove the table and lift a couple of hatches, that six-man seating area opens up to reveal a deep-set lateral double berth. It might sound claustrophobic but this ingenious bed enjoys reasonable natural light from its own dedicated porthole plus fair headroom and a decent bit of shelving for your bedtime ephemera. 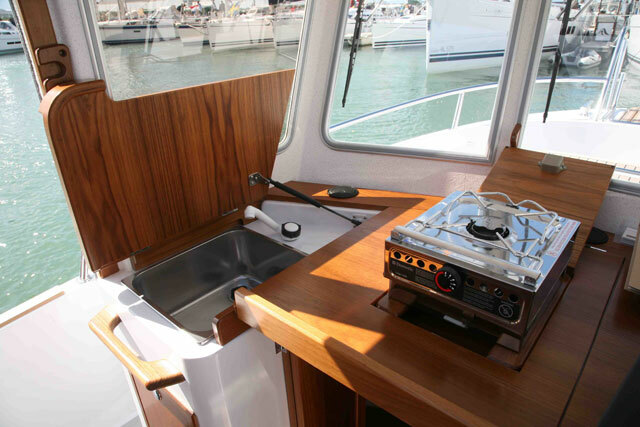 Step back out and head forward to the helm console and another magic trick reveals itself in the form of a sink and stove that emerge from beneath the chart table. In tandem with the fridge, which is built into the base of the helm seat, this means you have a perfectly serviceable galley. The sink and stove emerge from beneath the chart table like a magic trick. 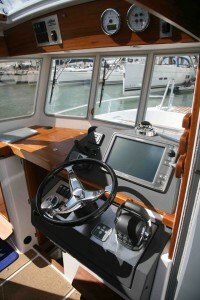 The helm is bright, open and beautifully equipped. You get a Raymarine chart plotter, oversized rails, a non-skid deck, an adjustable helm position and a stainless steel keel band. 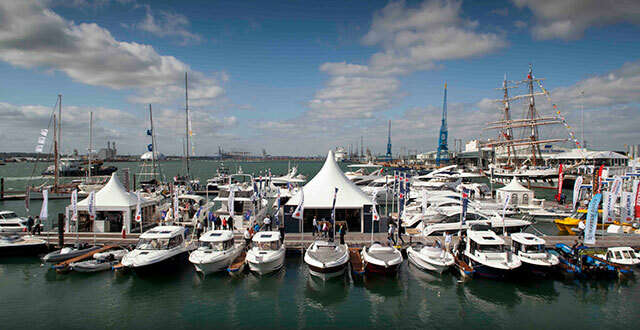 You also get windscreen wipers, demisters, large cleats and a range of easy embarkation points - and that ‘s to say nothing of the 300-litre fuel tank, the trim tabs, the bow thruster or the rooftop trio of spotlights. I could go on but I won’t. 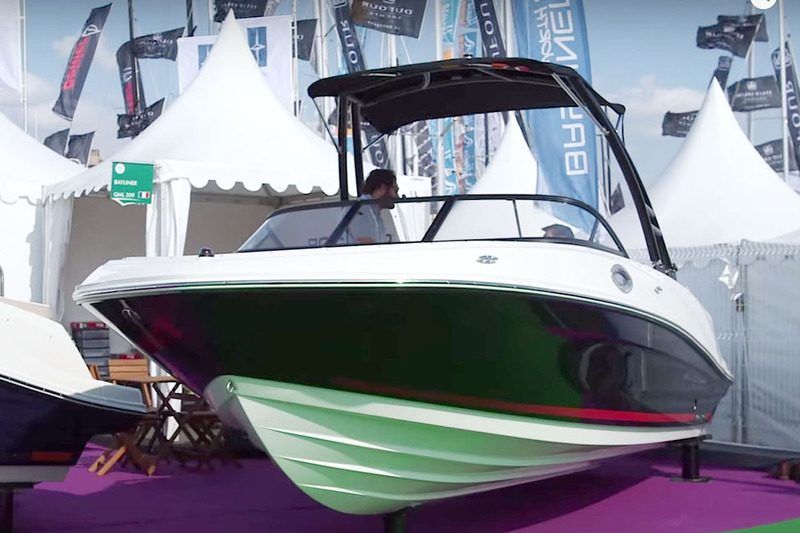 Suffice it to say that in features as well as space management, this is one of the most generous and versatile small sports boats you will see. On the face of it, a price of £114,000 might seem like a lot for a 25-footer but it does more than enough to justify the cost. It is an authentic multi-tool of a boat, with hidden tricks everywhere you look. It has two private double berths, a functional galley, sheltered communal seating for six, a proper aft cockpit for fishing and a hull that is built to cope with just about anything you care to throw at it. The fact that it is beautifully built, unstintingly equipped and likely to hold its value only adds to the formidable array of reasons why a Minor Offshore always seems to make more sense than the boat next-door. If I were only allowed to testdrive one boat from the 2013 event, this would probably be it.